President Rivlin meets Bishop Lekganyana, speaks about Jerusalem's unification and the friendship between Christians and Jews. 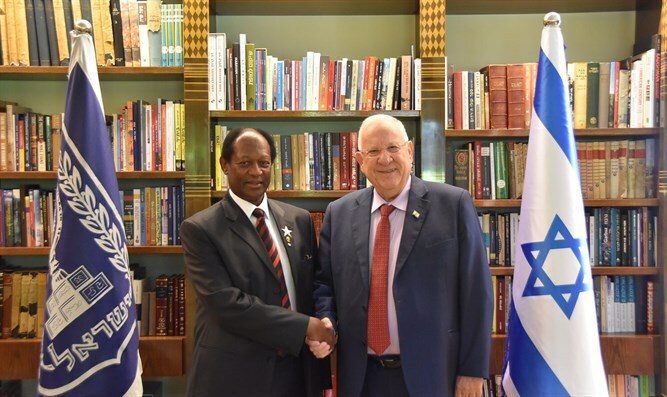 Israeli President Reuven Rivlin on Wednesday, met with Zion Christian Church (ZCC) head Bishop Barnabas Lekganyana, who was visiting Jerusalem as part of a tour of Israel. ZCC is one of Africa’s largest Christian churches. Rivlin welcomed Lekganyana and spoke of the importance of the strong friendship between the Jewish community and the Christian communities in Israel and around the world. Speaking about his family's long history in Jerusalem, Rivlin mentioned that he is a seventh-generation Jerusalemite. “We can hear any kind of criticism, but the idea to boycott Israel [goes] against the very idea that the people of Israel have a right to live in our homeland. This is something that we cannot accept. Lekganyana’s delegation told Rivlin of the tradition to gather millions of the Church’s followers together three times a year, and of the importance the community held in praying for peace for all mankind.